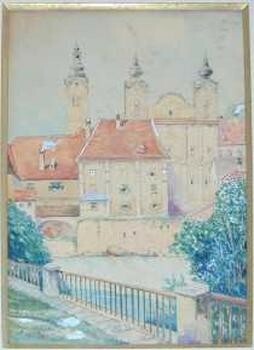 The Schloss Lamberg by the young Hitler. A detail of the Vienna Opera House. Hitler would later explore his ideas of monumental neo classical architecture with Albert Speer. The exhibition curated by Dr. Deborah Rothschild, curator of exhibitions at Williams College, which is to open in the next two weeks, includes approximately 150 paintings, drawings, watercolors, prints, posters, theatrical designs, vintage film footage, photographs, books, pamphlets and other examples of material culture. The exhibition is part of the Vienna Project that this summer comprises a cooperative effort between 11 cultural institutions in Berkshire County of Massachusetts. Charles Giuliano How does it feel to be immersed in this material? Deborah Rothschild Very oppressive. It’s so disturbing to think what if a million times. What if he had gotten into the Academy. I tend to think that the Third Reich was wrapped up with his fortunes. It wouldn’t have happened without him. He was a catalyst. You can understand it I have been watching his speeches and he was the leader. Even early speeches. Then I have a Degenerate Art section. DR Yes. Klimts, Schieles, Kokoschkas those three artists then a section on art he disliked. CG How do you get your hands on a Hitler? DR Very difficult. You have to search and find these people who do not want to be known. CG Isn’t there a large collection in Texas. DR He’s dissolved that collection. It doesn’t exist any more. That’s Billy Price. He had death threats and the place where he kept them was attacked. So he’s out of the Hitler business. CG What is the Hitler business? DR There’s a whole network of people who collect the memorabilia. They are not all fascists. None of the ones I’ve been in touch with. I wrote to Billy Price back when I first had this idea. I didn’t hear from him. Then in March I get this letter which has my letter in it nothing from him my letter sent back and inside articles about him and a letter from a six year old girl who calls him the worst person who ever lived because he collected this and then a testimonial from this woman who lived in Steventown and taught at the local schools who says he was not a Nazi and shouldn’t be hated. So I got in touch with her. She had moved to Connecticut, and she told me that her father had owned a work by Hitler. And Billy Price came to look at it. This was 20 years ago. I asked how did your father come to get it. She said he got it to get rid of this pest. This bum. Astrid Hiemer So he bought it in Vienna. DR In Munich Hitler was in Munich. 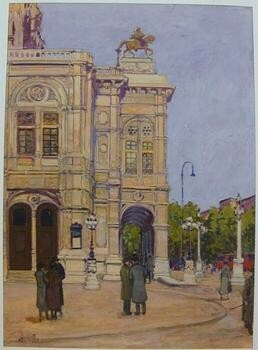 He was living in Munich about 1914 and he used to do the same thing paint nice charming views of cities. That’s how he made a living. He would come by a scraggly guy poorly dressed but trying to look presentable. And he would say, “This is your building.” Her father had a law office in one of these charming buildings. He came by every day and finally to get rid of him, he gave him the equivalent of two dollars. CG What kind of quantity of this material exists? DR There’s a lot of it out there. There are a lot of forgeries that you have to be careful about. There are certain people who can authenticate pieces. Also you look for the provenance. There’s paintings and little sketches on napkins. Depends on what you mean a total oeuvre including these little sketches includes probably 500 items. AH How would napkins survive I wonder? DR Just scraps of paper with sketches and notes. He gave things to people. Albert Speer had a lot of things. Hitler’s main thing was architecture, and he would draw and say I want you to do this. The early work is very interesting. Most of his dealers were Jewish. Most of his friends. He went to this homeless shelter, and there met a man named Reinhold Hanisch. Who was a drifter but German, and Hitler loved anything German. Even from young boyhood he was a pan-Germanist. They became friendly. CG Hitler was born in Germany and emigrated to Austria. DR No Hitler was born on the border in Austria. In Braunau Am Inn. It’s a border city. He thought of his home town as Linz. So this in Vienna in 1909 Hitler, and this Hanisch guy tried to get any work he could. He had no coat and it was winter. At the homeless shelter they disinfected his suit and it turned lavender and that was all he had. And since Hitler told him he was an art student Hanisch suggested that why don’t you make these post cards of city views and sell them. They had a partnership to sell them, and that’s how it started. We have Hanisch’s hand written memoir which is going to be in the show. It was found by Otto Kallir the founder of the original Neue Gallerie. He was the first to show many of the modern Viennese artists. And the Neue Gallerie in New York is dedicated to him. In the memoir Hanisch talks about Hitler’s friends who were Jewish and the dealers who were Jewish. Because he names names, Brigitte Hamann was able to go to records and check who these people were. She found that all this information was true. 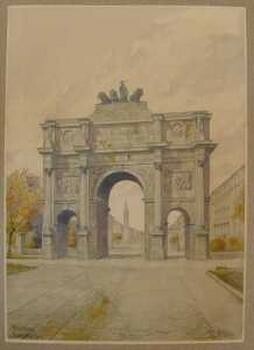 One of the Hitler watercolors in our show was framed by a Jewish man who was his main dealer. CG What kind of security are you taking? DR We are probably going to have extra security. We’ll have to see. CG Have Hitler paintings been shown in the US before? DR I think so, yes. Because the man who is lending them to me said that he has loaned them before. There was an exhibition on Eisenhower, Churchill and Hitler as artists at the Truman library. When you see the Hitler watercolors they are totally charming, nothing threatening. Totally benign and pedestrian and nothing. One is the chapel in the mountains. Another way to know provenance is that Hitler used to say he liked to deal with the Jews because they would take on work that they hadn’t sold. Sure enough when a lot of these inventories were later taken in the Thirties, his works were there with the dealers. CG What do you know about the works that were confiscated by the US Army after the war? DR I’m trying to get one of those works. CG They are still in Washington under state of the art security. DR This is what is interesting. We had a loan of one of them. Then it was just taken away because the litigation was just starting again. It was the heirs of Hoffmann, it was his archive. Heinrich Hoffmann was Hitler’s photographer for 25 years. There’s thousands of photographs in the archive, and I’ll be showing some of them. AH How did they get them? DR They (US Army) seized them. They have some Hitler things as well and there are six things, and I wanted one of them from the Vienna period. CG Did you see the MacDermott and MacGaugh show? DR Yes, because of you. Because I read about it in Maverick. CG You’re kidding. That was a good show. DR It was a good show. CG Those images of Hitler with the traditional German script written on them. Starting in 1971, I became intrigued by this history and during a period of unemployment over a year I read a lot of material. DR Susan Sontag has written about that fascination. I think we are still traumatized by it. AH I saw the first horrible films of the Holocaust and the camps when I was just six. I was totally traumatized. CG When I first bought a house in East Boston, I had a gallery for a period of time and we did an exhibition project, “Aftermath Two Women Talk About War,” (Erica Marquardt and Susan Erony) A German woman and an American Jewish woman. They decided to collaborate. Six of us, the women and their husbands, sat down and talked about the subject. DR Having watched a lot of films on Hitler I think that if I was in Germany and wasn’t Jewish I would have been swept up too. I’d like to think I wouldn’t have, but who knows he was so charismatic and the Reich presented a feeling of national identity. After the war he helped make people feel good about being German. With jobs, building projects, communal suppers, Party congresses, pageants and parades. Also the propaganda machine was so powerful. That was the scary part. AH For most people, it is very mixed feelings. It is all about making a living and hearing and knowing then going to war and losing your brothers and uncles. The general idea is that people knew about those camps. They didn’t necessarily know what was being done. I was an adult when I first saw how many camps there were. And as many Eastern European forced laborers died as in the camps. DR 55 Million people died in the war. CG We don’t talk about this all the time but we were having a conversation about this recently, and Astrid said that she doubted she could have been a party to that. In terms of who she is. Not doubting or questioning that but my response is always, I don’t know. I couldn’t look you in the eye and say no. You have to understand the entire historical context. CG What are your thoughts about the synergy of the Vienna project bringing together so many institutions and projects? DR It’s a great idea. CG When it was presented to you did you say, I have just the idea? DR Not really I had been on leave. CG Somebody said to me about you that you were forced into it. DR That’s not true at all. It was my idea to do the show. CG I heard that they twisted your arm. DR I twisted their arm; they didn’t want to do it. I really had to lobby to do this show. People were afraid of this as a challenging show. CG Why did you want to do it? DR Because it’s fascinating and wanting to get at the truth. To try to bring to light things that people don’t know and to show that he was not an original thinker that all of his ideas came from other sources. It diminishes him. CG In a sense do you want to get rid of this gu-- to exorcise him? DR I want to take him down a notch. He’s not an evil genius. He wasn’t born evil. If things had gone his way I think he would have been quite happy to be an academic art professor. AH Are you saying then that he was swept up himself? DR Yes, events and circumstances changed him and changed the world. He was at the homeless shelter just a while and then at a men’s hostel, trying to sell these post cards and lived in poverty. I’m not trying to make excuses for this cruel, malevolent and the hate-filled person he became, but his ideas did not come out of thin air-rather they were in the air. His early love of all things German set the stage for the racism that followed. But all the evidence shows that he was not an antisemite when he arrived in Vienna. He did serve in the German army. He hated the Austrian army. When the war was declared, he was ecstatic he couldn’t wait to fight for Germany. He wouldn’t fight for Austria. As he spent time in the city he came to hate the Austro-Hungarian Empire because of its multi nationalism. In fact he was a draft dodger when he left Vienna in 1913. CG Isn’t it true that up to the time of the Third Reich Germany had the most assimilated Jewish population of any nation in Europe? DR I think so. His idea was that the Germans were the best of the worst. He had a plan where eventually the Germans would be racially purged as well. To get to a pure Aryan race. To be purged of any other influences. In fact when they conquered new territories the SS would take back young women to breed with pure Aryan men. To him nonAryan races were like insects, a parasite or infection. CG Jorg Haider and Adolph Hitler are they book ends? What then are your sensitivities of promoting Austrian culture? Is this a gloss for the right wing political regime? DR That’s why it is important to have this show at an antidote to that. CG In other words, take this exhibition out and it become a very different project. DR Absolutely. How this came about it is that I was on leave and came back on July 1 and was told we had to do a Vienna show. While I was gone, they had been looking into taking the Freud show. It went to Chicago. I looked into that and it was taken it was going to be in Tel Aviv. So I started to think of the Vienna show. I had a conversation with a colleague who lives in Vienna half the year, and Eva Grudin said there is this really great book, “Hitler’s Vienna a Dictator’s Apprenticeship,” and you should get it. I did and there were no pictures so I put it down. I said what is this? It isn’t what I had in mind. I started reading it, and I said, you know, there is an exhibition here, this is amazing. CG Has this been a tough show and talk to me about that? DR It’s tough because people automatically take the point of view that you are glorifying Hitler. It is just my opposite intent. It’s been tough trying to find the loans and doing the work. It’s a three year project which I have squeezed into one from inception to execution so it has been all consuming. Getting the loans people being not sure of wanting to lend. Loans falling through objects that are not right. CG What grant writing did you do for this? DR No grant writing. The college funded it. CG Did you travel to Vienna? DR Michael Conforti and the Clark generously funded a trip. All the curators I met were very kind to me. I am borrowing from the Historische Museum they have been very gracious. I have several loans from them. The Theater Museum there has been fabulous. Also the National Library and the Jewish Museum in Vienna and Brigitte Hamann herself. CG How did you have to convince them? DR I didn’t have to convince them. They leant the show. The Belvedere where I wanted to borrow did not lend. They did not answer me. DR The Jewish Museum was most cooperative I got some great early pieces of Anti Semitica from 1900-1910. It’s the same as what was going on later. It’s identical. From the National Library I’ve gotten some posters. AH What is your introduction to the show? DR There’s a video. You come in and there’s a panorama of Vienna and a video of the years. CG The show is opening on July 13 why so late. DR (Laughs) Give me a break. It’s amazing that I could get it done in just a year. There's so much to do. Also we have to have it up for the students in the fall. They are our primary constituency. CG What kind of attendance do you get at Williams? DR It depends on the show. When we did Tony Oursler we got a huge attendance. When we showed Dale Chihully we broke all records. When we had African American quilts people just loved that show. CG Thanks so much for your time we look forward to the exhibition.